Preen® Weed Preventer Plus Ant, Flea & Tick Control 4.25 lb. 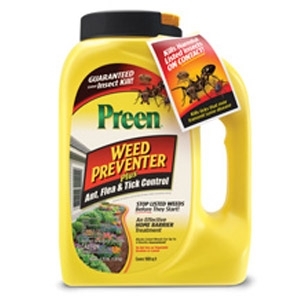 Preen Weed Preventer Plus Ant, Flea & Tick Control is designed specifically for use in the foundation beds that surround and beautify your home. In one step, Preen Weed Preventer Plus Ant, Flea and Tick Control creates an effective home barrier that prevents new weeds from growing and kills more than a dozen listed insects on contact – guaranteed.